Protect your hearing organs from sudden loud noises with the Walkers Game Ear Ultimate Power Muff Quads. Enjoy security without compromising comfort with this earmuff design for a tough job. Walkers Game Ear Ultimate Power Muff Quads features Four Hi Gain Omni directional Microphones. The said feature, partnered with the Low Noise/ Frequency tuned feature offer much help to the user. The work both as a canceling element for unnecessary and deafening noise. In addition to that, the Omni directional microphones maintain clear sound delivery to the user. With such feature, one can be secured of the healthy amount of sound delivered to and blocked from the ear. Controls of the amount of noise entering the ear do not end there. It also presents an independent volume control along with an independently adjustable frequency tuning. This part allows users to gain more control over the amount of sound entering the ear. Its customizability offers more opportunities for many users and makes it more flexible. Whether the user is significantly or slightly tolerant of the noise from the environment, it can be adjusted accordingly. Keeping and storing this product is made easier and more convenient as it is foldable. Users can safely fold and snuggly tuck it inside a bag or a pouch. Fitting it with the head is also not an issue. This is because of the comfortable headband framed with a metal wire frame for firmness and durability. The ear cups are placed moderately low at either end of the headband. This allows better adjustments for all users, given the distance of the said ear cups from the average. To enhance the experience and safety of the user, it even has a sound dampening composite housing. This characteristic is like the second filter of the sound before it makes its way to one’s ears. This composite housing is partnered with NRR 27dB and sound activated compression. As for its Sound Activated reaction time, it only takes 0.02 seconds to respond and function. This response time is quick enough to activate specific function needed for protection of the hearing organ. For its internal functions, the Walkers Game Ear Ultimate Power Muff Quads feature a recessed volume or AFT control knobs. Through the said controls, the user gains access to the port of batteries. To make this earmuff function, one must provide two pieces of AAA batteries, which are included in the package. Placing batteries in this equipment is a no-brainer and can be done in just a short time. Safety, comfort, and style are rolled into one equipment as this device covers it all for the user. He or she can use it anytime and anywhere without any worry of deformation or such. The batteries needed are already provided in the package, which saves the customer more time and money. Placing the batteries is a very convenient process and does not take up much time. Regardless if this equipment is used indoors or outdoors, users can be assured of the excellent ear and comfort protection that it can give. It has a compact design which allows the users to save space for storing it and find convenience using it. Some customer reviews have it that it makes a squealing sound every time it issued near a mobile phone. This can be a great nuisance for users, especially if they are using it in a public place. Given that it is battery-powered, it would mean having to replace those at some point in time. Once it starts to malfunction or show some signs of it, the expenses can be quite high, not to mention inconvenient. One must give it back to the manufacturer and pay an amount approximately $70 for the repair. On top of that, one must wait for a couple of days before it gets repaired and return for usage. When it comes to comfort and functionality, many people have experienced it. Many people have hailed this equipment as an excellent find when you are hunting. The value for money was elevated with these necessities offered. However, the durability of this product seems to be the issue for many customers. Many of them have complained about how fast it can wear off. For this matter, an individual must deem it necessary to think this through. It might cause money to repair this equipment once it begins to show signs of malfunctioning. Despite these comments, many still see its value elevate with the kind of protection it gives that works for both indoor and outdoor conditions. Also, the fact that it already provides the necessary batteries makes it even more convenient and preferable. 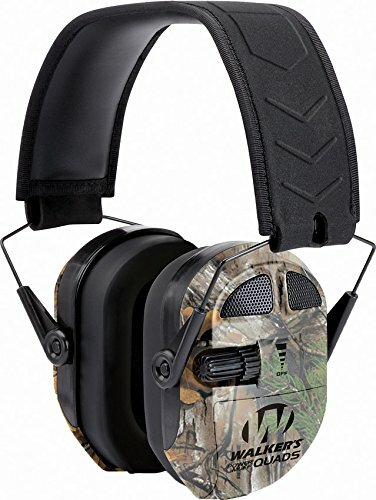 Walkers Game Ear Ultimate Power Muff Quads would be of great use to target shooters, hunters, wildlife enthusiasts, and the like. Given that shooting and gunshots will always be present in such activities, an ear protection equipment is a must. Also, considering its design, which presents a camouflage effect, makes it best for activities to be conducted in the woods. Those who are also into scouting and wildlife observation would also find this product handy. This follows the same reason that gunshots and other sudden extreme loud noise will be inevitable with such activities. Considering that it also has a sound enhancement mechanism, enthusiasts can also use this in predator detection. They can quickly locate and identify if an animal is nearby through enhanced sounds reaching them. Also, users can have this equipment maximized since they will be used in a more spacious area. Regardless if it will be used as an indoor or outdoor ear protection device, the Walkers Game Ear Ultimate Power Muff Quads are guaranteed to perform best for activities involved. Evaluating the Walkers Game Ear Ultimate Power Muff Quads, it has gained quite a good reputation despite some backlashes. Regarding its comfort, there is no doubt that this ear protector does its job well. It utilizes some filters for the sound and at the same time gives comfort with the firm and soft compact design. Also, regarding protecting the hearing and organs and the comfort it provides, it is worth the price—and beyond.